On October 2nd, the kids from homeroom 10B at Bloomberg High School in Manhattan got flu shots. On October 3rd, they developed telepathy. 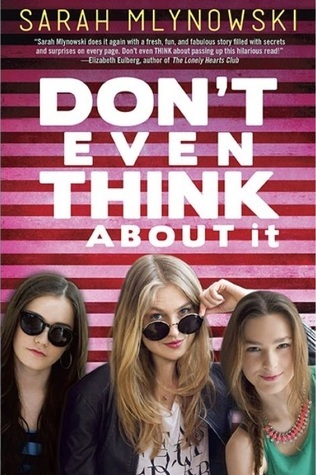 In Sarah Mlynowski's latest novel, the aptly-titled Don't Even Think About It, a group of fifteen-year-olds realize that knowledge is power -- and that power isn't all it's cracked up to be. Initially, some of them think it's neat to be able to read other people's thoughts, but then they realize it's a two-way street, and that other people from their homeroom can read their thoughts, too. The kids have to figure out ways to shield their thoughts or else risk exposing not only their own secrets, but also things that they know about their friends and family. Now they know each other's silly, fleeting thoughts and trivial concerns about zits and jeans and crushes as well as more serious matters of cheating (on boyfriends and girlfriends, on quizzes and tests) and they aren't sure what to do about their unexpected condition. During their private lunchtime meetings, self-perception mixes with group reception. When people realize what their friends, family members, and classmates really think about them, they get hurt, and alliances shift. Soon, it's clear that they have to decide whether or not to tell others about their telepathy - whether or not they are prepared for the fallout. "Every single person down there is ignoring your pain because they're too busy with their own. The beautiful ones. The popular ones. The guys that pick on you. Everyone. If you could hear what they were feeling. The loneliness. The confusion. It looks quiet down there. It's not. It's deafening." You might look at the cover of the book, which showcases three teenage girls, and wonder why I'm posting about this at GuysLitWire. The book has protagonists of both genders. Mlynowski has chosen to use the first-person plural "we" throughout the book, never pinning the narrator to be one specific character but instead letting the group at large relate their story. Nicely, each of the main characters has a distinct storyline and personality, from the easily-worried Olivia to the carefree Cooper, from Tess, who has a crush on her best friend, to BJ, who hits on every girl in his path. YA readers may also pick up on little shoutouts to other authors and books, such as one character's nail polish color being called We Were Liars, a nod to a novel by E. Lockhart. If you liked Don't Even Think About It, keep your eyes peeled for the sequel, Think Twice, which is scheduled to come out in 2015. If this is your first taste of Sarah's writing, check out her backlist of titles, which also includes novels for adults and for younger readers.